You need to look no further than B’Sorah for that ultimate running compilation of bushveld diversity, from riverside trails and forest, to open savanna. Underfoot it’s a kaleidoscope of fast open, to rocky hilltops and everything in between. The poplar forest closes out the final trails along which you need the footwork of Springbok winger to avoid the close packed trees. As a stage for the closing race in the GSTS18, you could get no better. Like the weather, the racing was hot. For the most part, the leaders in the Series had done what they had to secure the Series win, but in many instances, second and third places were to go down to the wire. In the Championship Open category, ‘just’ 43 seconds (or 3.4sec/km) was the closing difference in the race for 3rd place, with Andrew Currie nabbing the final spot on the podium from Stephen Atkinson. But by far the closest was the 3 second gap separating 4th & 5th in the Veteran men's Championship race, with Carl Sandrock the victor over Loic Cadion and in doing so stealing the final step on the podium from his rival. In the Challenge Series, the closest battle was in the Masters race, with Gerrie Coetzee and Johnie Jonker tying up the Series on points at the line, leaving us to separate gold and silver based on their acculative time. After crunching the numbers, Gerrie Coetzee proved the victor by just 1 minute 32 seconds over the four race series. It was another commanding run by Bernard van der Kuil, taking line honours in the 12.8km in 58:01. Charging in to take second over the line was a rampant Marelize Retief, finishing only 4 minutes behind Bernard. Tim Price rounded out the top three over the line in 1:02:33. Leon Scholtz completed the men’s podium with a 4th place over the line, closely followed by Sandra Mansvelder in 5th to take 2nd in the ladies race in 1:04:33. Kerryn Prowse completed the ladies podium in 1:16:09. The master men’s podium was separated by 20 seconds, with Leon Limper snatching the win from Douw O’Kelly by 12 seconds in 1:10:31 (10th overall), who in turn pipped the eventual 2018 Masters Champion Gert Steyn by only 8 seconds. In the 6.6km Challenge route is was Rob Donkin in first in 29:02, followed closely by 14 year old ‘Minimee’ category Series champion Tiaan Dorfling in 30:58. Johan Kruger made the top three in 31:03. Special mention needs to be made of 10 year old ‘Peewee’ Series Champion Scott Williamson and 11 year old Lean Scholtz finishing 4th and 5th over the line respectively. Lean’s race result secured him a matching 2nd place in the hotly contested ‘Minimee’ competition, behind a rampant Tiaan Dorfling - super impressive given he is 3 years his junior! Charine Kruger led the ladies race in the Challenge, breaking the tape in 32:39. Leanri Williams and Dominique Walters concluded the ladies over the line podium. 12 year old Claire Fisher ran in an impressive 17th overall and 3rd in her ‘Minimee’ category. This final result secured her 3rd place in the overall Series, snatching the final podium place from Thina Makapela by 1 point! Just five seconds behind Claire in the final race was 14 year old Kaylen Scholtz. Christa Coetzee took charge of the Masters ladies race, winning in 40:08, some 4 minutes ahead of Sue Botha. The veteran ladies race was separated by a mere 3 seconds, with Marinette le Roux the victor over Elke Thompson in 42:24. Johan Kruger, Chris Dorfling and Craig Marshal were all separated by only 52 seconds in the battle for 2nd, 3rd and 4th respectively in the Veteran mens race, 2 minutes back from overall race winner Rob Donkin. The open category was even closer, with just 46 seconds separating the podium, with Ryan Marshall, Ryan Walters and Daniel van der Walt finishing in that order. A huge thank you to our sponsors and partners Jaybird, Raidlight, Steenberg, Pepsi Max and Petzl (sunset race) for their amazing support. Last but definitely not least, a huge thank you to all of you for your support and participation! If you have any comments or feedback please feel free to email info@wildrunner.co.za and if you took pictures or have stories to share please include either @wildrunnerza or the hashtag #GSTS18 on your posts so we can like and share! The 2016 edition of the 32km Spur Silvermine Mountain XL began under grey skies as some of the Cape’s top trail runners came out to enjoy the magnificent Silvermine Nature Reserve. This race sees runners traverse both Silvermine East and Silvermine West and really is a race of two halves. In the men’s solo event, it was tight at the top as the top 5 were all within 30 seconds of each other at the first check point, 13km in, with up-and-coming Raydon Balie all smiles as he led veteran and defending champion Nicholas Rupanga, Ben Brimble, Rory Scheffer and Chad Gordon through the check-point in 01:15:20. 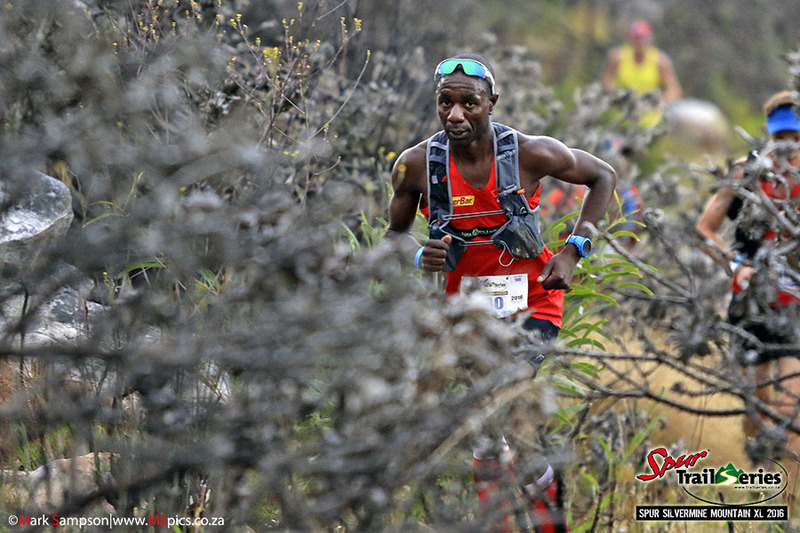 The second half of the race saw solo runners tackle 14km of Silvermine West trails and it was soon evident that this race was to become a game of cat and mouse, with the leaders marking each other until the final 5km to the finish. 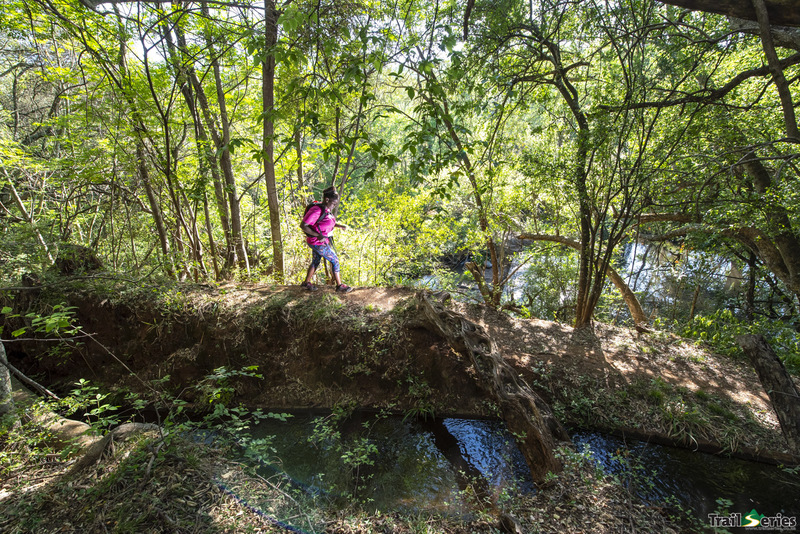 At the 27km mark and the second check-point, it was Balie and Rupanga who once again checked in as the top 2. This is where Rupangas’ experience came to the fore as he pulled away on the descent to the finish to wrap up his second consecutive Spur Silvermine Mountain XL in a time of 02:47:48. Balie sealed his 2nd place on the podium in a time of 02:49:31 and Ben Brimble rounded off an impressive top 3 by crossing under the arch in 02:52:35. In the Ladies 32km solo race there were two clear favourites and friends - Megan Mackenzie and Kate Mapham, who locked horns with Sandra Koblmüller, a professional triathlete from Austria who was first to the 13km check-point in a time of 01:25:18. Megan was hot on her heels in 2nd place with a time of 01:26:21 and third to check in was Kate Mapham, 01:34:23. The next 14km saw Koblmüller put the hammer down as she relished the technical terrain and downhill to run into the second check-point in an accumulated time of 02:44:05, four and a half minutes ahead of Mackenzie and more than 20 minutes ahead of Mapham. In the end there was no denying Koblmüller the victory as she powered her way over the 32km course in 03:07:49 with Mackenzie, who seemed to take a tumble out on course, cruising home in second place in a time of 03:14:24. Mapham held off the charge to seal her spot on the podium with a time of 03:37:16. In the Men’s team event the duo of Niel Swanepoel and Edward van der Merwe blew everyone away with a dominant display of running, coasting home in 2:45:31 - more than 15 minutes over the 2nd placed team, Team DJ. Team DJ claimed second place in 03:01:46 despite tough competition from the Llandudno trail surfers, as Robert Shaff and Michael de Kwaadsteniet ran a good race to take home third place, with an overall time of 03:05:24. The Llandudno trail team rounded off a superb day for the lifeguards as the ladies (consisting of Linda Detering and Daniella Mihal) ran home in first, with a time of 03:30:23, with trail stalwarts Maxine Reilly and Charlotte Noble claiming an impressive 2nd overall in a time of 03:44:46. The Mamas, comprised of Natalie Marcus and Mmamapudi Kubjane, rounded off the top 3, crossing under the arch in 04:21:21. In the Mixed team event, Cornel Smuts and Leentjie Visser proved that consistency counts as their respective leg positions remained unchanged, to come home first over the line with a time of 03:15:18 with team Just Wing It, made up of Ben Kooyman and Tessa Engelhardt, claiming 2nd mixed team overall with a time of 03:20:23. Rounding out the top 3 mixed teams went to Jason Lammers and Marta Jakot of team Dos Cabras, who cruised home in 03:33:10. It was another magical edition of the Spur Silvermine Mountain XL and a big thank you must go to our sponsors; Spur Steak Ranches, BOS Sport, La Sportiva and Protea Hotels. For results click here and take a look at the photos here.